Preheat oven to 400. Sift together flour and baking powder in a medium sized bowl. I dont have a sifter so I just whisk them together. Stir in cornmeal and salt until blended. In a small bowl, cream together butter and sugar until fluffy. Add dry ingredients alternately with milk until well blended. Fold in cranberries. 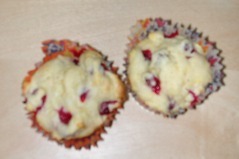 Spoon into prepared muffins tins to about ¾ of the way filled. Bake about 20 minutes or until the muffins look "set" in the middle and are just about to turn golden.The cranberries will have split and oozed a little bit by this point, so don't be alarmed. Serve with butter or plain.